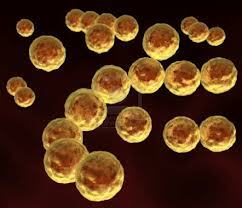 Bacteria are the smallest of all living organisms on Earth. They’re found everywhere – in the ocean, in clouds, on mountaintops, on living things and even on dead things. 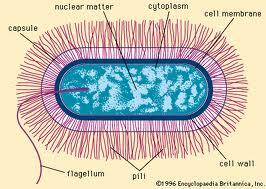 Bacteria are made of one cell. The cell contains the DNA, which is sort of like a computer program. It contains the information to run the bacteria. Surrounding this one cell is a rigid cell wall, which protects the bacteria. Some bacteria have an outer jacket, which sometimes has hairs called pili. They may also have flagella, which are long threads that beat around so the bacteria can move. Some Bacteria under microscope where you will know if the bacteria: good guy or bad guy. Bacteria usually live in colonies and reproduce quickly. There are 10,000 known species of bacteria. There are probably many more waiting to be discovered. Bacteria are divided into three groups. Cocci bacteria are round. They can be found alone, in pairs, in clumps or in long strands. Bacilli bacteria have a straight shape. Spiral bacteria look like corkscrew pasta. Bacteria feed on matter in the environment, like fallen leaves, raw meat, human skin or decaying wood. Bacteria can reproduce about once every 20 minutes. Some bacteria are harmful. These bacteria can cause serious diseases, such as tuberculosis, typhoid fever and even tooth plaque. Most bacteria are helpful. 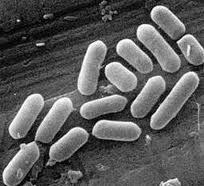 Bacteria thicken yogurt and cheese. Bacteria in our stomachs help process food and keep us healthy. Bacteria: Good Guy or Bad Guy? 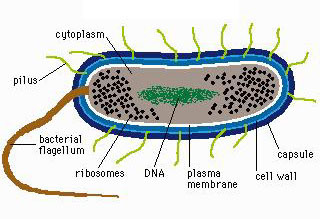 Main parts of a typical Bacterium. Bacilli bacteria have a straight shape. An animated video all about a bacterium talking about itself. Question: Do antibiotics kill bacteria? Answer: Antibiotics can kill bacteria and keep us healthy. Some vaccines also fight bacteria. One of the best things you can do is wash your hands with soap and water. Wash hands when you get home from school, before you eat and after you use the restroom. 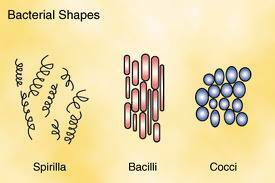 Three Main types and shapes of bacteria. Question: Do bacteria live in the soil? Answer: Some bacteria live in the soil. They help break down dead matter so plants can use it. They are called soil builders and they’re good for your garden. Enjoyed the Easy Science for Kids Website all about Bacteria info? Take the FREE & fun Bacteria quiz and download FREE Bacteria worksheet for kids. For lengthy info click here.